Setak, M., Kafshian Ahar, H., Alaei, S. (2017). Coordination of Information Sharing and Cooperative Advertising in a Decentralized Supply Chain with Competing Retailers Considering Free Riding Behavior. 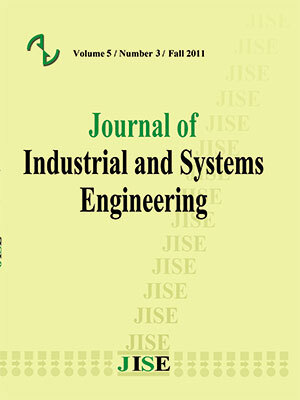 Journal of Industrial and Systems Engineering, 10(2), 151-168. Mostafa Setak; Hajar Kafshian Ahar; Saeed Alaei. "Coordination of Information Sharing and Cooperative Advertising in a Decentralized Supply Chain with Competing Retailers Considering Free Riding Behavior". Journal of Industrial and Systems Engineering, 10, 2, 2017, 151-168. Setak, M., Kafshian Ahar, H., Alaei, S. (2017). 'Coordination of Information Sharing and Cooperative Advertising in a Decentralized Supply Chain with Competing Retailers Considering Free Riding Behavior', Journal of Industrial and Systems Engineering, 10(2), pp. 151-168. Setak, M., Kafshian Ahar, H., Alaei, S. Coordination of Information Sharing and Cooperative Advertising in a Decentralized Supply Chain with Competing Retailers Considering Free Riding Behavior. Journal of Industrial and Systems Engineering, 2017; 10(2): 151-168. This paper studies a decentralized supply chain in which a manufacturer sells a common generic product through two traditional and online retailers under free riding market. We assume that the traditional retailer provides the value added services but the online retailer does not. Factors such as retail prices, local advertising of the retailers, global advertising of the manufacturer and service level of the traditional retailer simultaneously has effect on market demand. This paper studies the cost information sharing between the manufacturer and traditional retailer and uses the cooperative advertising program as an incentive mechanism for information sharing under free riding. This paper also examines how the free riding phenomenon affects the information sharing between the manufacturer and traditional retailer and also the supply chain coordination. Our analysis shows that, through the cooperative advertising program, information sharing between the manufacturer and traditional retailer is always beneficial for all the supply chain members and therefore, the entire supply chain is coordinated except when the traditional retailer is not efficient and the degree of free riding is relatively small. Alaei, S., Alaei, R. & Salimi, P. (2014). A game theoretical study of cooperative advertising in a single-manufacturer-two-retailers supply chain. The International Journal of Advanced Manufacturing Technology, 74, 101-111. Alaei, S. & Setak, M. (2015). Multi objective coordination of a supply chain with routing and service level consideration. International Journal of Production Economics, 167, 271-281. Arshinder, Kanda, A. & Deshmukh, S. G. (2008). Supply chain coordination: Perspectives, empirical studies and research directions. International Journal of Production Economics, 115, 316-335. Aust, G. & Buscher, U. (2014a). Cooperative advertising models in supply chain management: A review. European Journal of Operational Research, 234, 1-14. Aust, G. & Buscher, U. (2014b). Game theoretic analysis of pricing and vertical cooperative advertising of a retailer-duopoly with a common manufacturer. Central European Journal of Operations Research, 1-21. Aust, G. & Buscher, U. (2014c). Vertical cooperative advertising in a retailer duopoly. Computers & Industrial Engineering, 72, 247-254. Cachon, G. P. & Lariviere, M. A. (2005). Supply chain coordination with revenue-sharing contracts: strengths and limitations. Management science, 51, 30-44. Chen, J. & Bell, P. (2011). The impact of customer returns on decisions in a newsvendor problem with and without buyback policies. International Transactions in Operational Research, 18, 473-491. Chiang, W. & Feng, Y. (2007). The value of information sharing in the presence of supply uncertainty and demand volatility. International Journal of Production Research, 45, 1429-1447. Choi, H.-c. P. (2010). Information sharing in supply chain management: A literature review on analytical research. California Journal, 8, 110-116. Dukes, A., Gal-Or, E. & Geylani, T. (2017). Bilateral Information Sharing and Pricing Incentives in a Retail Channel. Handbook of Information Exchange in Supply Chain Management. Springer. Ghadimi, S., Szidarovszky, F., Farahani, R. Z. & Yousefzadeh Khiabani, A. (2011). Coordination of advertising in supply chain management with cooperating manufacturer and retailers. IMA Journal of Management Mathematics, 24, 1-19. Hall, D. C. & Saygin, C. (2012). Impact of information sharing on supply chain performance. The International Journal of Advanced Manufacturing Technology, 58, 397-409. Hsiao, J. & Shieh, C. (2006). Evaluating the value of information sharing in a supply chain using an ARIMA model. The International Journal of Advanced Manufacturing Technology, 27, 604-609. Iyer, G. (1998). Coordinating channels under price and nonprice competition. Marketing Science, 17, 338-355. Jørgensen, S. & Zaccour, G. (2014). A survey of game-theoretic models of cooperative advertising. European Journal of Operational Research, 237, 1-14. Karray, S. & Hassanzadeh Amin, S. (2015). Cooperative advertising in a supply chain with retail competition. International Journal of Production Research, 53, 88-105. Kunter, M. (2012). Coordination via cost and revenue sharing in manufacturer–retailer channels. European Journal of Operational Research, 216, 477-486. Li, B., Hou, P.-W. & Li, Q.-H. (2015). Cooperative advertising in a dual-channel supply chain with a fairness concern of the manufacturer. IMA Journal of Management Mathematics. Liu, H. & Özer, Ö. (2010). Channel incentives in sharing new product demand information and robust contracts. European Journal of Operational Research, 207, 1341-1349. Liu, H., Sun, S., Lei, M., Leong, G. K. & Deng, H. (2016). Research on Cost Information Sharing and Channel Choice in a Dual-Channel Supply Chain. Mathematical Problems in Engineering, 2016. Liu, Y., Ding, C., Fan, C. & Chen, X. (2014). Pricing decision under dual-channel structure considering fairness and free-riding behavior. Discrete Dynamics in Nature and Society, 2014, 10 pages. Mahajan, S. & Venugopal, V. (2011). Value of information sharing and lead time reduction in a supply chain with autocorrelated demand. Technology Operation Management, 2, 39-49. Partha Sarathi, G., Sarmah, S. P. & Jenamani, M. (2014). An integrated revenue sharing and quantity discounts contract for coordinating a supply chain dealing with short life-cycle products. Applied Mathematical Modelling, 38, 4120-4136. Pasternack, B. A. (2008). Optimal pricing and return policies for perishable commodities. Marketing Science, 27, 133-140. Qian, Y., Chen, J., Miao, L. & Zhang, J. (2012). Information sharing in a competitive supply chain with capacity constraint. Flexible Services and Manufacturing Journal, 24, 549-574. Qin, Z. (2008). Towards integration: a revenue-sharing contract in a supply chain. IMA Journal of Management Mathematics, 19, 3-15. Raju, J. S., Sethuraman, R. & Dhar, S. K. (1995). The introduction and performance of store brands. Management science, 41, 957-978. SeyedEsfahani, M. M., Biazaran, M. & Gharakhani, M. (2011). A game theoretic approach to coordinate pricing and vertical co-op advertising in manufacturer–retailer supply chains. European Journal of Operational Research, 211, 263-273. Shamir, N. (2012). Strategic information sharing between competing retailers in a supply chain with endogenous wholesale price. International Journal of Production Economics, 136, 352-365. Shin, J. (2007). How does free riding on customer service affect competition? Marketing Science, 26, 488-503. Tsay, A. A. (1999). The quantity flexibility contract and supplier-customer incentives. Management science, 45, 1339-1358. Tsay, A. A. & Agrawal, N. (2000). Channel dynamics under price and service competition. Manufacturing & Service Operations Management, 2, 372-391. Umit Kucuk, S. & Maddux, R. C. (2010). The role of the Internet on free-riding: An exploratory study of the wallpaper industry. Journal of Retailing and Consumer Services, 17, 313-320. Van Baal, S. & Dach, C. (2005). Free riding and customer retention across retailers' channels. Journal of Interactive Marketing, 19, 75-85. Wu, D., Ray, G., Geng, X. & Whinston, A. (2004). Implications of reduced search cost and free riding in e-commerce. Marketing Science, 23, 255-262. Wu, J., Zhai, X. & Huang, Z. (2008). Incentives for information sharing in duopoly with capacity constraints. Omega, 36, 963-975. Xiao, T. & Yang, D. (2008). Price and service competition of supply chains with risk-averse retailers under demand uncertainty. International Journal of Production Economics, 114, 187-200. Xie, J. & Wei, J. C. (2009). Coordinating advertising and pricing in a manufacturer–retailer channel. European Journal of Operational Research, 197, 785-791. Yao, D.-Q., Yue, X. & Liu, J. (2008). Vertical cost information sharing in a supply chain with value-adding retailers. Omega, 36, 838-851. Zhang, J. & Chen, J. (2013). Coordination of information sharing in a supply chain. International Journal of Production Economics, 143, 178-187. Zhang, J., Gou, Q., Liang, L. & Huang, Z. (2013). Supply chain coordination through cooperative advertising with reference price effect. Omega, 41, 345-353.